$77 for a half hour PHONE reading, regularly $88. PLease donate to my Blog writings as this allows me to keep writing topnotch daily info for you. SPECIAL 27 month preview of SATURN IN SAGITTARIUS as it Transits to your natal chart. Regular Price is $175 for a 1 year transit. A special bundle of 6 half hour phone readings 10% off regular price in Canadian dollars. Looking for a unique & Perfect Gift? A gift that gives back to the receiver many times over with real value and lasting memories? Astrology Natal chart readings or Transit readings and Tarot Readings are invaluable gifts. 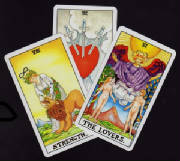 A Tarot reading/consultation makes a fabulous pampering gift. Give one to your girlfriend, Mom, Dad,sister, in-laws, your boss, your boyfriend, husband, a neighbour, your child. Everyone always wants to know more about themselves. understanding. A Tarot reading gifts you with undivided respect, it is therapeutic, A spa session for your Psyche, your soul. It's the best time-in you can have. Give someone the gift of a Tarot party! Tara will come to your home enlighten and entertain you and your guests. Readings can be short-5-7 minutes per person. I personally recommend spending about 10 minutes per person for more indepth readings. I can get to a lot of information in 10 minutes! For a larger private party I can supply you with other Tarot readers, Astrologers, Palmists, Tea Leaf Readers, a psychic Iridologist, Ruins readers, certified handwriting analysts, numerologists, aura readers, Crystal ball gazers and more. Prices start at $150 per hr. in the Toronto Area. Extra charges added for outside of Toronto for travel and expense time. An Astrology reading of a persons' natal or birth chartis an invalueable gift and a great tool. The readings of a chart gives incredible insight into a persons personality, motivations, likes and dislikes and why, career, health, relationships, friends, money potential, parents, children, communications skills, difficulties and how to deal with them,times of change. An Astrology reading explains your natal chart and transit charts. Transits are the up to the minute aspects the planets impel for you over a certain time period. Written reports can be about 20-28 pages long, explaining all the data referred to in the reading. Refer to the information and re-read as often as you like. I take great pride in my children's reports, I personally rewrite every detail of the child's Natal report, offering insight which parents will find invaluable in knowing who their child is, what motivates them, how they think and feel, how they relate to their parents and siblings, why he/she acts like they do, career potential, how to deal with your child in the most life enhancing way for their greatest growth. Give the Gift of an Astrology Party! Get your friends and co-workers together and stage an Astrology/Reach for the Stars party. Everyone can get a quick peak at their own Horoscope. It's not just your Sun Sign. Where your Moon was when your born tells everything about how you feel, why you are attracted to certain people, things and activities. Where your Mercury is shows how you think and communicate. Where Venus is, shows what your values are, how you want to be romanced, your relationship to money. Where MArs is, shows hoe you act, how you defend yourself, what motivates you. In a woman's chart it shows, what kind of man attracts you. Where Jupiter is, shows where you expand your philosophy, how you search for truth, your brand of optimism,what your risk level is. Saturn shows what you want to build, what you respect, where you're your most disciplined, relationships to authority, etc. etc. interactive, upbeat, easy to understand style.